Use the whole spectrum of color to your advantage for your next promotion! Photo-quality images and graphics can now be applied where previously only pad printing was available. In the last few years, digital printing technology has made it possible to put a full color imprint on many 3 dimensional items. 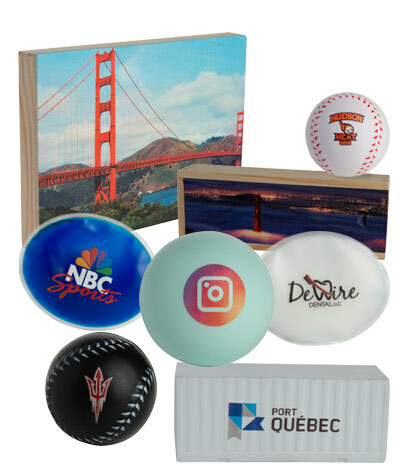 Instead of a simple one or two color imprint this technology opens up a whole new array of possibilities for full color advertising. Full color printing is not yet available on all items. Inks for some materials are not yet available. Pictured here is a sampling of items that can be used for full color printing. Please call us for more ideas and information. Pricing is related to the size of the imprint as well as other factors. As a guideline, smaller coverage areas would incur a running charge of $0.75/v; larger coverage areas, $1.50/v. The set up charge is $60/v, repeat set up charge is $45/v. Special handling charges and additional production time may apply. Click here to see all of the items that can be printed in full color. Please see below art requirements for the 4 color process printer. Acceptable Formats: Camera ready artwork. High resolution (.jpeg; .png; .tif) 300 ppi or higher. Vector artwork acceptable however exact PMS color matching cannot be garunteed. Unacceptable Formats: Low resolution pixel based files are not usable. Artwork submitted under 300 ppi. • All fonts and strokes need to be converted to outlines. • Minimum font size is 7pt. • Vector artwork with large amounts of white or white only text will not print well. • We cannot digitally print Metallic Pantone colors. • Digital artwork will be output as CMYK. Please note specified PMS color are not guaranteed. • Raster images and effects will be printed in CMYK. • Remove any overprint, clipping masks or transparency effects. • RGB-colored art needs to be converted to CMYK prior to submission. • Artwork should be sharp, clean, smooth and free of jagged lines/shapes. • Send artwork early to avoid production delays. All graphics are subject to review and approval before production. Please note color matching is not garunteed for all colors with the 4 color process. If you have any additonal questions please contact our Art Department.